Lip, Lip, Hooray! Do a happy dance to celebrate this incredible NEW vegan lip balm flavor. Our silky smooth formula is adored by even the most sensitive lips. 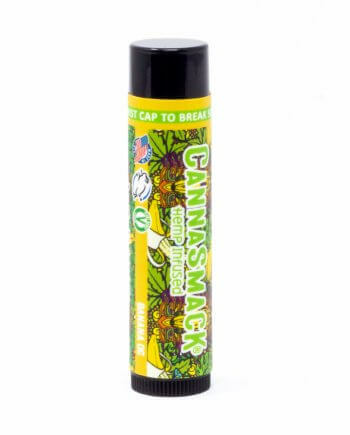 Infused with premium hemp seed oil, paired with a formula of all natural ingredients, CannaSmack bestows a kiss of reliable hydration with vitamins A, B, D, E and Omega 3&6 fatty acids. This is our second flavor collaboration with HappyTokes; we designed this label to feature her favorite creatures: Dinosaurs! I love the happy tokes watermelon lip balm! The scent is amazing and smells like true watermelon. The feel of is incredible too so silky and smooth. My lips never felt this good. This was my first lip balm to try from CannaSmack and this lip balm is the best! The watermelon flavor is amazing and it feels so silky smooth on my lips. I’m a big fan of cannasmack now and already purchased a few more.